Aéroports de Montréal is pleased to offer passengers travelling with young children and infants arrangements and services designed to ensure that their airport experience is as pleasant as possible. We also invite you to inquire with your airline as to available onboard services. Passengers travelling with an infant or young child are given priority at security screening checkpoints “A” and “C” (departures). Most of the boarding lounges at Montréal–Trudeau are equipped with small play areas. Courtesy carts for children are available at the information desks in the departures area. Most restrooms in the terminal have adjacent nursing rooms, equipped with a sink, chair, changing table and, in many cases, a microwave oven. 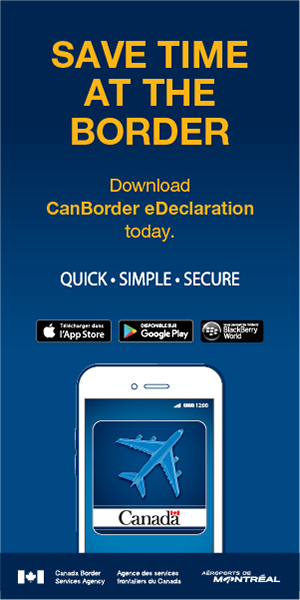 In the international and transborder jetties, electric cart service is available to passengers requiring it, from the security checkpoint to the boarding gate (departures level) and from the arrival gate to the Canada customs hall (arrivals level).